The quieter TX series redefines reliability for the industry. 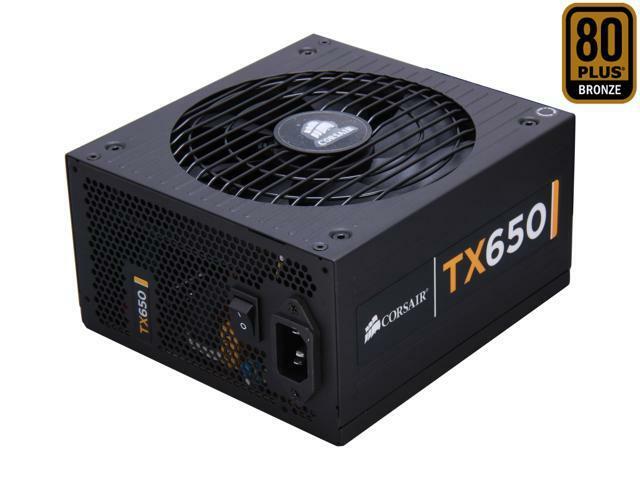 With fanless mode at low loads and 50C temp rating, the TX series is legendary for being reliable, efficient, and using high-quality components. 0.99 Active Power Factor Correction provides clean and reliable power. Featuring 80 PLUS Bronze efficiency, the TX series uses less power and produces less heat. A dedicated single +12V rail offers maximum compatibility with the latest components. Each PSU also includes long, pre-sleeved cables, perfect for modern cases with the PSU on bottom. Cools when needed An ultra-quiet 140mm double ball-bearing fan delivers excellent airflow when needed. When at low loads, the power supply will be in fanless mode. Designed to work under conditions 50°C temp rating and industrial-grade 105°C primary capacitors ensure amazing reliability and stability under extreme conditions. 80PLUS Bronze certification The 80 PLUS Bronze certified power supply provides high power efficiency of at least 82% at any load between 20% and 100%, saving your money on your electrical bill, reducing heat in your computer's system and prolonging its life. NVIDIA SLI Certified Featuring two 6+2-pin PCI-E power connectors, the Corsair CMPSU-650TX power supply has gone through a series of rigorous NVIDIA SLI certification tests for maximum system stability when building NVIDIA SLI PCs. Fanless mode at low loads for quiet operation, with an ultra-quiet 140mm double ball-bearing fan that delivers excellent airflow when needed. 50C temp rating and industrial-grade 105C primary capacitors ensure the five year warranty for peace of mind. Pros: Purchased on April of 2009. Died December of 2018. Cons: I have to find a new one. They don't make it anymore. Pros: Finally died yesterday after almost ten years of hard use through multiple builds. Replaced with another Corsair, no other issues. Other Thoughts: Great reliability. Good upgradability with this PSU, but make sure it meets all your cabling needs. Also, you should probably get modular if you have a smaller case or want better airflow. Pros: Installed 7/29/2010. Still working over 8 years (and 3 builds) later. Pros: This power supply has been in my workstation since the year 2011. Never experienced any issues. Other Thoughts: 6.5 years of fairly heavy use is pretty good, and the failure being limited to the PSU is a good thing (and like someone else mentioned, it technically did keep delivering power after the "pop"... but given the burning metal smell I didn't keep running it). On the other hand I've had some OEM system power supplies last longer, notably a Pentium 4 whose PSU lasted till system retirement in 2011, and a Pentium 2 whose power supply still works after 19 years (of lighter, but much longer-duration, use). All said, 4 starts seems right for the balance. Other Thoughts: I would definitely recommend buying corsair products, they last and they work like they are intended. Other Thoughts: Well, colour me impressed. I purchased this in 2010 and have never had power issues through multiple system upgrades. This is the only component left from my 2010 build that is still pertinent and going strong. Well done Corsair.